Sharon is an author, speaker, pastor’s wife and mom of two boys who lives, with her family, in North Carolina. She has been a regular contributor to Christianity Today, Propel, and She Reads Truth, and she is currently working on her first book, set to release in 2017. In addition to writing, Sharon recently completed her PhD, which explored the stories and experiences of women called to ministry. Sharon speaks a message of hope, truth and courage into our lives. I can’t wait for you to meet her! IF YOU HAVE EVER FELT LEFT BEHIND AS OTHERS ACHIEVED THEIR DREAMS, THIS IS THE EPISODE FOR YOU. Sharon tells of the lengthy season of preparation God brought her through to write her first book and, though it was difficult, how she now sees His purpose in it. She shares about the pruning He’s done in her life and the impact of comparison, idolatry, and fear of man on her heart and ours. 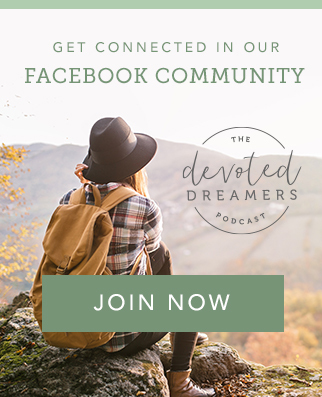 She cautions us about making our dreams about us (instead of about our Creator, God) and offers helpful advice about which voices to listen to as you’re pursuing your God-shaped dreams. Inc. Magazine’s take on the "10,000 Hour Rule"
Subscribe to receive promotional offers and updates about Sharon’s book launch in 2017.